When you're in the market for a new projector, you need to consider more variables than when buying a new TV. Projector brightness vs. room brightness. Connection distances. Single or multiple screen aspect ratios. Screen distance. Setup process. As such, while it might be easy to set up a television, it can be rather difficult to hook up projectors if you've never owned one before. 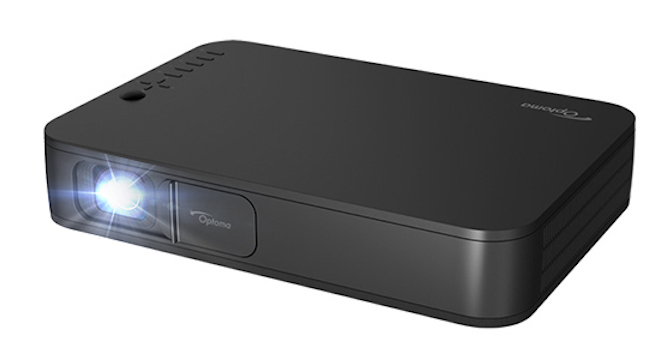 Luckily, the new Optoma LH150 1080p HD projector has a ton of excellent capabilities -- including DLP technology, wireless streaming, and great image quality -- while coming in a compact and portable unit. It can even run for as long as 2.5 hours without being plugged into a power source and play audio via Bluetooth speakers. The Optoma LH150 looks excellent and sophisticated for being such a portable unit. The projector weighs under five pounds and measures in at 11 x 7.5 x 2.25 inches. There is a matte black finish, which doesn't make the projector look plastic at all. On top of the unit, there are buttons to adjust the screen, cursor buttons to navigate menus, an enter button and a power button. There is only one LED light on the unit to notify you that it's turned on. The sides of the unit have sleek venting so that plenty of cool air can circulate through and keep the projector cool. The backside contains all of the hookups, including two HDMI inputs, two USB inputs, and a 3.5mm out so you can hook up speakers if you want. It's simple and easy to setup for sure and you don't have to worry about a ton of LED lights blinking during play. On the bottom, there is a tiny kickstand if you want to adjust the eight of the projected image on a table or on a floor. The lens has a sliding door to protect it as well, which is nice, so that you don't lose those pesky lens caps with strings attached. Additionally, the projector comes with a small carrying case with modest padding and pockets with the A/C adapter, and a remote with batteries to control the LH150. Being a portable unit, you'll want an easy setup process, which the LH150 excels at. Simply plug into a power source, hook up a streaming device, media player, or video game system via HDMI to the unit, and you're in business. To adjust the screen size, toggle those four buttons I noted above until the projected image fits your screen or wall area. You can also easily change brightness, color, or contrast of the image. 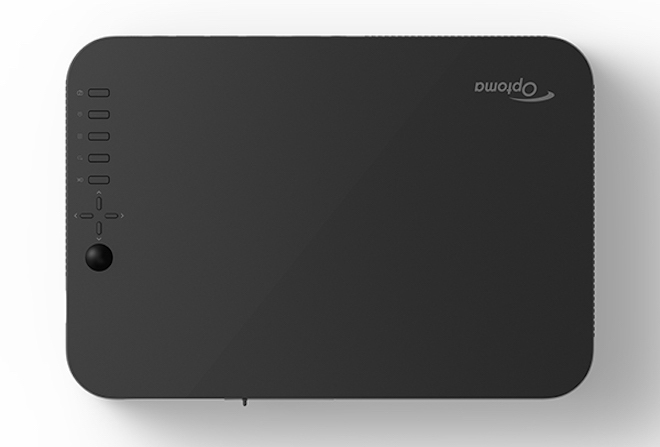 By joining your Wi-Fi network, you can streaming music or video from your mobile device to the projector. You can even connect sound to a Bluetooth speaker from this LH150, which is quite cool. If you don't have speakers, this unit comes with two 4 watts speakers which, of course, are soft and quiet, but if the room is quiet, you'll be able to hear clearly. Being a portable unit, this projector can also run up to 2.5 hours without being plugged into a wall outlet thanks to its rechargeable battery. So, if you want to watch a movie outside that isn't Titanic or the Extended Editions of the Lord of the Rings, you're good to go! I hooked up my player to the LH150 and watched the new Suspiria film. Like the original, the bold and vivid colors go well with the intense and sharp detail with a wide spectrum of colors. That being said, this new remake tends to travel with more of a neutral tone throughout the film of browns and beige everywhere, which truly accentuates the brighter primary colors in each scene, especially red blood. The original film was steeped in every bright color on the table, but these are two different visual styles here. The different natural tones on the walls and floors both are well saturated and balanced and give a very warm yet haunting look. When the bright reds, blues and greens come into play though, you’ll really see the best of the color here that just pops right off the screen. Detail is quite sharp throughout most of the film, with a ton of good closeups that that showcase facial pores, wrinkles, and some great practical makeup effects. Individual hairs and textures in the costumes all look great too. Black levels are deep and inky and skin tones are always natural. The 120-inch image never lost any quality or contained pixelation on this image at all. I was impressed. I also popped in the new Spider-Man: Into the Spider-Verse to see how the image stacked up against this unique bit of animation. The detail of facial features and costumes aren’t as detailed as say a recent Pixar film, but the detail is there where you’ll see the different stitching in the Spider-Man costumes and different facial features on each hero. Even the background items of city buildings and even trees in a rural area look insanely good. The flow of the animation is a little choppy, more so than what you’re probably used to, but again that’s the style here and not a video problem. Colors are bright, bold, and beautiful on every level. This film has a big color spectrum and the and the man 1,300 lumens surely ramps each primary color up from the different variations on the Spider suits to the darkness levels at night. Black levels are deep and inky and the animation lines are top notch, all of which look great on the LH150. Hooking the PS4 up to the unit to play Black Ops 4 was a load of fun and a much more enhanced gaming experience since you are looking at targets from far away, but now have double the screen size you would normally have, if playing on a television. There was virtually no lag time here and the gameplay was seamless and smooth. There was no pixelation with smoke grenades or explosions. It's definitely the way to play this game. I found myself playing better with the smoother transitions and easier to see targets on a bigger screen. I also hooked up the AppleTV to test the streaming options as well as use my phone to stream some YouTube videos, which worked like a charm. Picture quality was clear and bold at all times. There were no connection issues to speak of either. Videos on YouTube played promptly upon loading and never quit out nor did they contain any brightness issues, pixelation, or banding. It all looked good. I can only think that Optoma's 4K UHD unit might look even better. 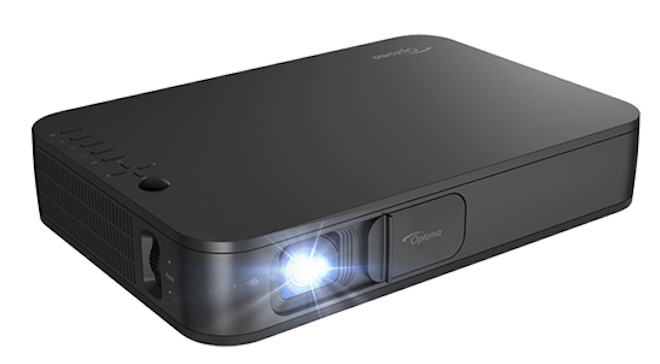 The Optoma LH150 is a lightweight projector with a ton of bells and whistles. You can stream wireless content from your mobile devices, connect audio to your Bluetooth speakers, easily set up the image on virtually any surface or screen perfectly, and more. There are 4 inputs in the back of the unit, interior speakers, and DLP technology. And you don't even need to plug it in (for up to 2.5 hours) to use it, so it's a great option for creating a backyard drive-in experience. Looking for a bright, bold, and portable HD projector that costs less than $900? The Optoma LH150 is Recommended!